Starting a career was never easy. But today its never been harder. The youth unemployment rate in MENA is at it’s highest in recorded history at 28%. That’s twice the global average. Join us to make launching careers simple, personal and rewarding. Oliv is a career platform and service made for university students and recent graduates. Connecting emerging talent to leading employers for internships, part-time jobs, and graduate jobs. Oliv is home to thousands of students and graduates, where their ambitions and personalities are aligned to careers. Today, more than 1,000 businesses from startups to global titans use Oliv to hire top emerging talent to grow their business, maintain a healthy talent pipeline, and reduce turnover. If you don't care, why should anyone else? Dare to bare your care. Wear it with pride. Take ownership of your initiatives. Ask for help when you need it, give it to others when they do. We have a clear vision, stay focused and champion our cause. Feed your natural curiosity. Grow your mind. Never stop asking “why?”. Be the best at everything you do and go out of your way to delight. Get to the truth, listen to others, and pick the battles that matter. Headquartered in the beautiful city of Dubai. 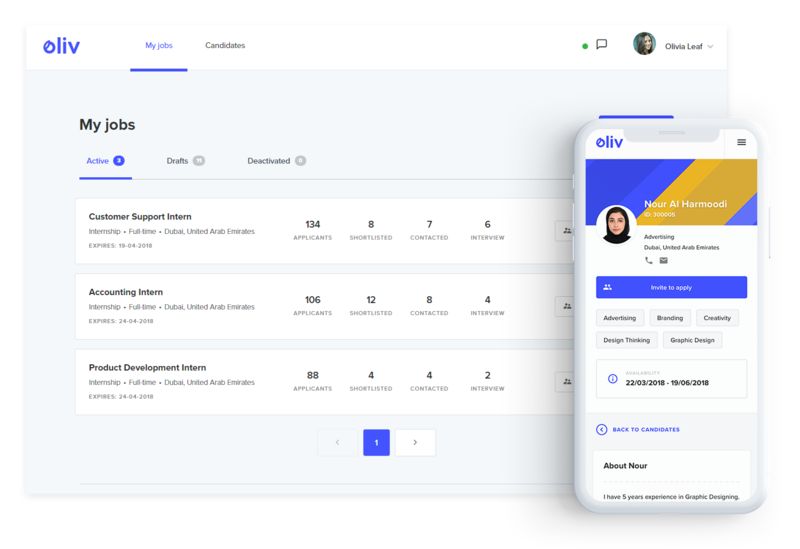 Oliv is a career platform made for the youth. Connecting talented students and new graduates to employers for internships, part-time and graduate jobs. Our mission is to make launching careers simple, personal and more rewarding.